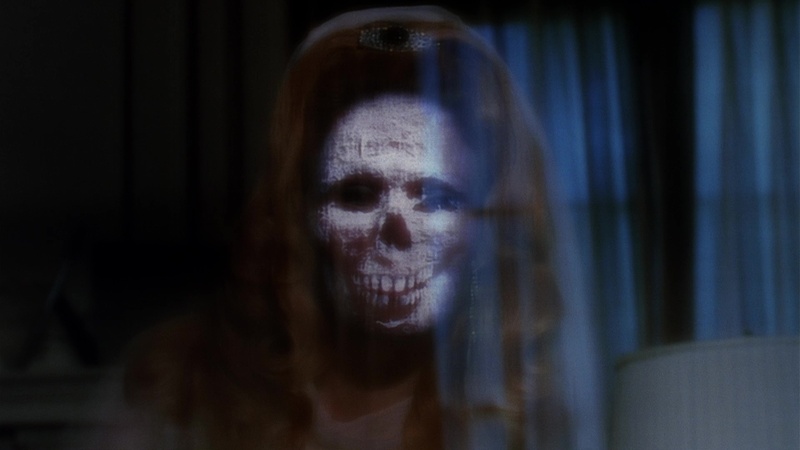 After his dying wife Laura (3 Worlds of Gulliver's Morrow) vows to return from the afterlife following her car accident injuries (and pops up as a skull-faced apparition for the opening credits), dedicated husband Fred (Jaws 2's Coe) decides to find a way to cheat death and speed his beloved back into the realm of the living. After a handful of thwarted attempts involving fake psychics and body snatching, he finds a solid possibility in the form of Dr. Death (TV veteran Considine), a flamboyant stage performer whose magic-oriented routines include the transplant of souls from one body to another. Dr. Death becomes relentless in his pursuit of bringing back Laura's essence and sets his sights on candidate, Fred's assistant Sandy (Miller), who would make a lovely vessel indeed. A wild, garish, entertaining collision of drive-in gothic '60s horror and '70s shag carpet sensibilities, Doctor Death (or as it's seen on the title card and old VHS releases, Doctor Death: Seeker of Souls) doles out the bloody goods while keeping its campy theatrics at just the right pitch. 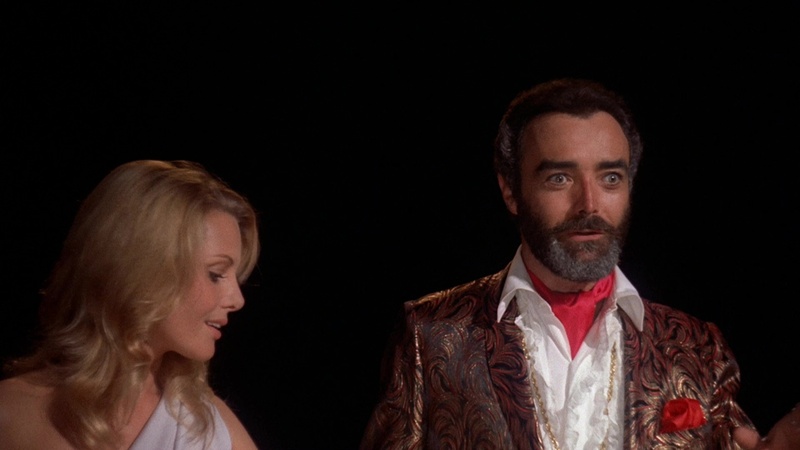 Fans of Robert Quarry and Vincent Price's outings from the same era will definitely get a kick out of the bearded Considine's theatrical performance, which is a pretty good indication of how The Wizard of Gore might have played with a good, appropriate actor in the leading role. (But then again, I wouldn't trade Ray Sager's performance in that for the world.) One-off director Saeta (who had done tons of second unit work since the '30s) keeps the plotline chugging along with just enough twists and turns to keep things interesting, with none other than former Stooge Moe Howard popping up in one scene for his final screen appearance! As with many films of the period, there really isn't a sympathetic character in sight (especially Fred, who takes his wife's death a bit harder than any rational human ever should); however, this just adds to the weird, E.C. Comics-inspired fun. Also keep an eye out for Florence Marly, the striking, uncredited star of Queen of Blood, who gets to wear some crazy, very sparkling outfits. Anyone who ever suffered through Prism's abysmal VHS tape of this title or any of the battered, washed-out repertory prints was in for a nice surprise when this hit DVD in 2010 from Scorpion Releasing. Surprisingly, Doctor Death turns out to be a crisp, colorful, and stylish, using colorful lighting and costumes to create a surreal, often very potent atmosphere that often feels like a vintage made-for-TV horror movie on acid. A really fantastic presentation all around that shows how a clean HD transfer from a film's negative can change a viewer's entire perception about the feature itself. The extras don't skip out either, with the best being a fun 9-minute video interview ("Doctor Death Commands") with Considine who colorfully talks about his role and his overall career with a lot of gusto. The late Saeta's son, Steve, also appears for a 10-minute video chat, "Remembering Eddie Saeta," about how the directorial assignment came about, which seems very unlikely for a first feature film effort. Considine also appears for a scattershot commentary track with Intruder helmer Scott Spiegel and Scorpion's Walter Olsen that's less lively than usual for the company but still contains a few useful nuggets of info here and there. Other trailers from short-lived '70s company Cinerama include Girly, Goodbye Gemini, and The Last Grenade; ah, and Considine also has an amusing video intro as Doctor Death himself before the feature in which he practices his art on one of his co-moderators, which must surely be a home video first. In 2016, Scorpion revisited the title for a Blu-ray with a fresh new scan from the negative that advances significantly over the already solid previous version. Those gaudy '70s colors are so vivid and precise they could cut your retinas, and the level of depth and detail bumps up several notches. The DTS-HD MA English audio sounds pristine as well, and both of the interviews are carried over, with the commentary and goofy intro falling by the wayside -- which isn't a tremendously tragic loss, though completists may want to hang on to their DVDs anyway just for that. Updated review on June 18, 2015.